« Bianca F’s NEW Group Gift!! 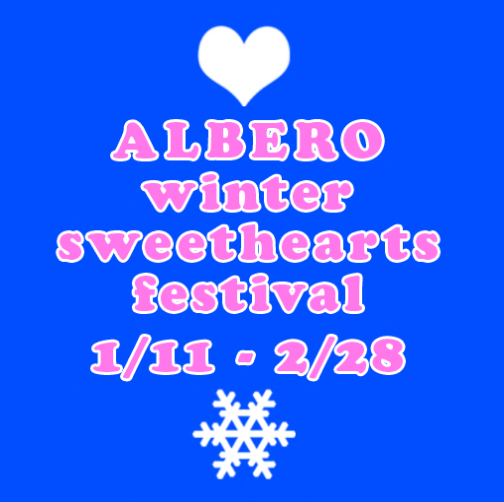 ALBERO Winter Sweethearts Festival 1/11 – 2/28! The festival is full of WINTER and LOVE related items, ranging from coats, hats and boots to Jewelry, gifts for your love and candies! Everything is decorated like a winter wonderland, so bundle up with your sweetheart and come visit. The participating vendors include Djinn & Tonic, slow kitchen, miel, Y’s House, d-lab, RC Cluster, This is a Fawn, Pididdle, Lazy Places, Scribble, Sand Shack Surf Co., The Plastik, Kunstkammer, Milk Motion, Feather, Napoliy, L. Fauna, Reek, Acid & Mala and tons more! >>>>> On Saturday, January 16th from 7pm to 10pm SLT we will have a party in the event park to celebrate the sims staying open and the festival, so please mark your calendars! Also, please be sure to check out both ALBERO & cioccolata sims as the new ownership of ALBERO have added several new stores! Please click one of our subscribe group signs to keep up to date on all the exciting events and expansions we have planned for the new year.